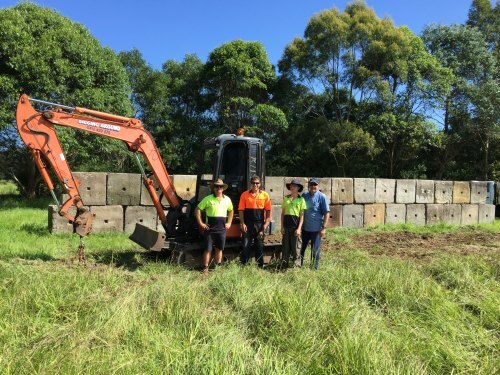 A huge thank you to Andrew from “Digging Around”, and Brian, Justin and John from “Real Aussie Sheds” who gave up many hours today to help me construct a silage bunker. This infrastructure will help us to store the abundance of certified organic pasture, grown in one of the best seasons we have had for many years. By keeping the cut feed in an almost airtight structure, it’s quality is retained, enabling our grazing animals to be well fed over winter. These plans have been on the drawing board for many years and only with the help these great people have we been able to bring it to reality.